A roof leak is one of the things you should not take for granted. What potentially could have been a small issue may snowball into a bigger and more expensive project. As with every leak, your main opponent is gravity. That means water stains are located at the lowest point of your ceiling or in the corners. In fact, fixing the leak itself is probably the easiest part for any contractor worth his salt in Miami. The trick, of course, is trying to find the source. Rainwater will flow into the loose nail, crack in the skylight, chimney or through the cavity in the galvanized sheet or shingle. It will then travel the path of least resistance through trusses and beams until it finds a split in the ceiling where it finally drips into the floor. Now, people tend to ignore the water stain on the ceiling because water has not yet seaped through and wound up on the floor. However, what they are doing is allowing the problem to fester and magnify. Mold and Mildew – This would be a potentially dangerous situation for your family as mold can enter the HVAC system and pose a risk to your children’s health. Flooded Attic – If you are only using your attic as storage, it makes sense that you do not check it out regularly. By the time you address the roofing problem, you have another setback on your hands. Fire risk – If you have some break in the electrical wires, water may result in an electrical short which may spark a fire. Finally, you may be compromising the structural integrity of your home. Columns and pillars will eventually weaken if water consistently flows down through them. Wooden beams and trusses are also vulnerable, and can cause your whole roof to collapse. While the roof is vulnerable to the outside elements like rain, snow, sun and wind, a faulty or wrong installation of the HVAC system may cause condensation inside your home. This could cause roof damage. It is important that you work with a competent HVAC installer to make sure humidifiers, ACs and heaters are functioning properly. Water moisture as a result of condensation will eventually find their way up and stops at your roof. You are watching your favorite TV show when a heavy downpour starts. Suddenly you hear water dripping from somewhere. You look up, and your roof is leaking. What do you do? First off, take a bucket and contain the leak. You may have to wait for the storm to pass because there’s nothing you can do at this point. When you notice your ceiling swelling, however, you need to puncture that bulge with a sharp knife or a screwdriver to allow the accumulated rainwater to drop to the floor. The last thing you need right now is for your whole ceiling to cave in due to the pool of water above. Instead of placing a bucket to catch the droplets, you can also create an alternate path for the water to flow through the use of a plastic gallon, a garden hose and lots of duct tape. If you do not want this hassle, call us for roof repair immediately. 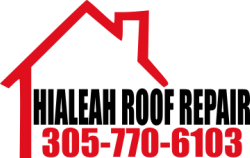 We are one of the foremost roof experts in Miami and in all of South Florida. Hialeah Roof Repair is the most Affordable Top Quality Roofing Professional in South Florida, but the bottom line is, it's always very difficult to know because we are talking about individual scenarios here. The only way to know for sure is to call us so we can send a Roofing Professional to your home to do a Free Roof Inspection to determine the extent of the damage. At this point, it is safe to say that the expense will depend on the type of roof you have as well as the condition of the roof deck, rafter, flashings, collar beams, ridge board and the valley joist. Moreover, those are just the insides of the roofing components. We are not even talking about the shingles, gutters and vent pipes. As you can see, there are intricate parts of your roof that need to be individually examined to make sure that when we leave your home, we leave you with a peace of mind. If the whole roof needs to be replaced, you need to secure a permit from your local council or homeowners association, and that will entail a few bucks in fees. Does Insurance Cover the Cost? ​You will have to talk to your insurance company about this. However, repairs done by Hialeah Roof Repair in Miami are usually covered in case of fire or extreme weather conditions. While your insurance policy will cover water damage, the amount of reimbursement may not be to your liking as the insurer will also factor in the age of the roof and the number of times you called in professional help for cleaning and maintenance. As we always say to clients who come to us, their calls came in too late. The time when you call in a professional would have been yesterday. Regular cleaning and maintenance will save you money in the long run. That is because any small problem is immediately addressed and any future leak nipped in the bud. Call us for professional ﻿roof repair and maintenance in Miami﻿. We are one of the contractors that offer a long-term warranty because we are so confident about the quality of our work and the satisfaction of our clients. Hialeah Roof Repair Rated 5 / 5 based on 11 reviews.